We didn’t travel far from home when I was growing up. 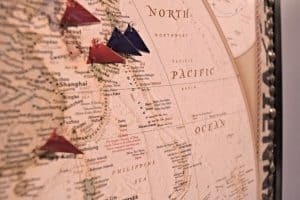 It wasn’t until college that I was bitten by the travel bug, hard. Now I want to go to all. the. places! Even our son loves to go on adventures, and would rather stay in a hotel than in his own bed. 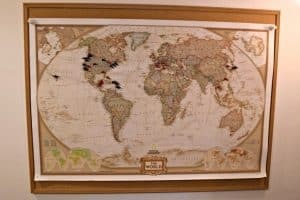 We’ve been keeping track of our travels on a big world map pinboard with colored flags to pinpoint each location. When we moved to our new house, the bland colors of the frame and cork board didn’t fit in with our new decor. It was demoted to the laundry room, where the humidity caused the corners of the map to curl up. The whole thing was looking pretty sad. It’s time to give it new life so it can be proudly displayed in our family room! We have this National Geographic map which clearly marks cities with a dot for easy pinning. If you’re more of a domestic traveler, here are some nice maps of the United States. This one is similar to mine. 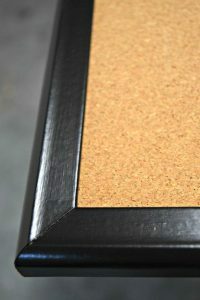 You want the cork board to be slightly larger than your map. I used this travel-themed one. You can find lots of similar options here. I use various colored flags to indicate where different people have gone. Red for my husband and I together, and blue for our whole family. You could use another color to indicate where you would like to go in the future. 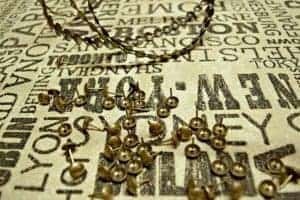 I used the antique gold color, and 5 yards was the perfect amount for my project. After removing the pins and map, I was left with a boring brown cork board. I planned to paint the frame black to coordinate with the lettering on my fabric, so I covered the edges of the cork with painter’s tape. I had a small can of black paint leftover from another project, which I applied two coats to the edges of the frame with a small paint brush. So much better already! Next comes the fabric. 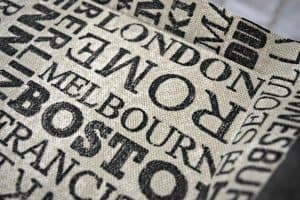 I’ve had a yard and a half of this city themed fabric in my fabric hoard collection for ages. It has a burlap texture, so it wasn’t going to work for the throw pillows I had envisioned. But it was perfect for this project! I placed the fabric on top of the framed bulletin board, making a note of where I wanted the words to be located. I trimmed off the excess, leaving just enough overlap to cover the frame. I flipped the fabric over, and sprayed the back generously with the spray adhesive. 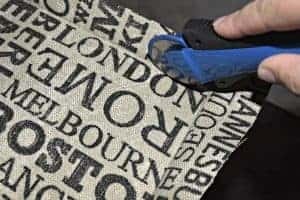 This particular adhesive is repositionable, making it easy to move the fabric around and get the words lined up exactly as I wanted. 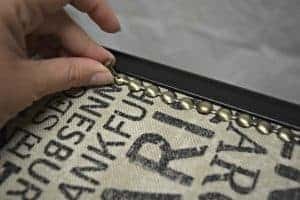 Once it was in place, I pressed the fabric down and creased the edges and corners with a fingernail. I used a rotary cutter right up against the edge of the frame to trim away the excess fabric. Be careful not to press down too hard or you’ll cut straight through the cork! 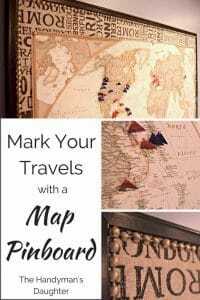 Adding the fabric totally transformed the look of my map pinboard! I was tempted to leave it as is, but I wanted to add a bit of bling to the edge of the frame. 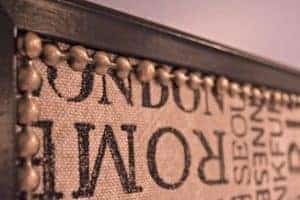 This upholstery nailhead trim was the perfect addition to take my project up a notch. It was super easy to attach, too. It comes on a roll, with additional nail heads that are used just like thumbtacks on a bulletin board! 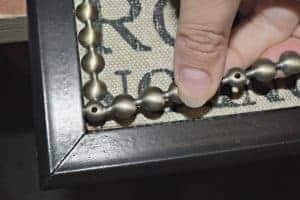 To secure the trim to the board, simply insert a nailhead pin into the hole in the trim. On furniture, you would use a hammer to do this, but it goes in easily with just your finger here. At the corners, I snipped off the excess with end cutting pliers. 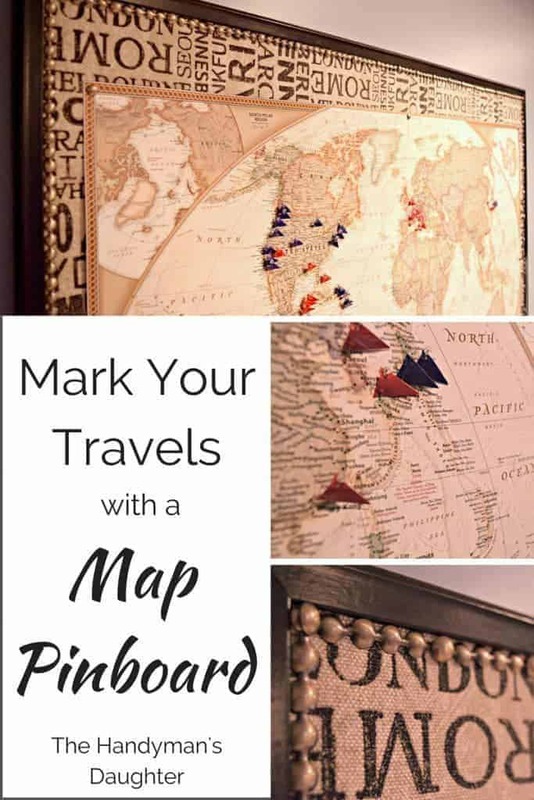 The dimensions of my map pinboard matched up perfectly with the holes of the nailhead trim. I just overlapped the holes at the corners and covered them with a pin. What a transformation! It’s hard to believe this is the same drab bulletin board. I’m loving the fabric background so much that I might buy a smaller map just so you can see more of it. So many places without pins! I want to visit them all! 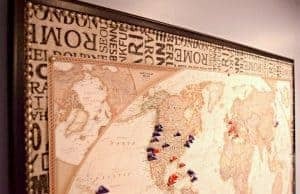 Want your own map pinboard but don’t want to DIY it? Here’s a similar framed map with cork backing I found on Amazon here. You can choose your own frame color, and it even provides you with the pins! 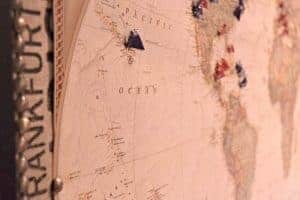 Love this map project and want to see more like it? Check out these great ideas from my fellow bloggers! This turned out fab!! I love the fabric that you used! Thanks Sam! I was so excited to finally have a good use for it! 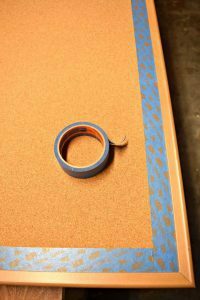 This DIY project is awesome to try. And, it will motivate us to plan more trips. Your travel board is looking fantastic. 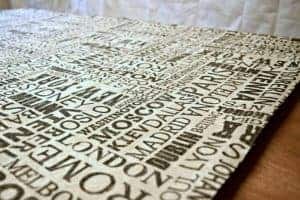 These travel board would make a lovely wedding gift for a couple who loves to travel! Love this! My daughter and her husband are currently traveling the world. This would be a great way for us to keep up with where she is and where they have been. Thanks so much for sharing!